President Obama's Burial Plot a Massive Waste of Taxpayer Money-Fiction! - Truth or Fiction? President Obama's Burial Plot a Massive Waste of Taxpayer Money-Fiction! President Obama’s Burial Plot a Massive Waste of Taxpayer Money-Fiction! President Barack Obama has submitted plans for an Obama family burial plot that would be located next to the Washington Monument on the National Mall and would cost taxpayers about $120 million. President Obama has not submitted plans for an Obama family burial plot to be located next to the Washington Monument that would cost taxpayers $120 million. Barack Obama has just submitted his plans for burial in a plot that will house his entire family, citing the Kennedys, the Tafts and the Roosevelts as precedent, inside a monument he had designed to celebrate the nation’s first black president. The monument, which will occupy space on the National Mall along with monuments to Washington, Lincoln, Jefferson and hundreds of thousands of fallen heroes, will cost the taxpayers roughly $120 million and will be listed as a national historical place with 24 hour protection from the 3rd US Infantry Regiment, just like the Tomb of the Unknown Soldier. 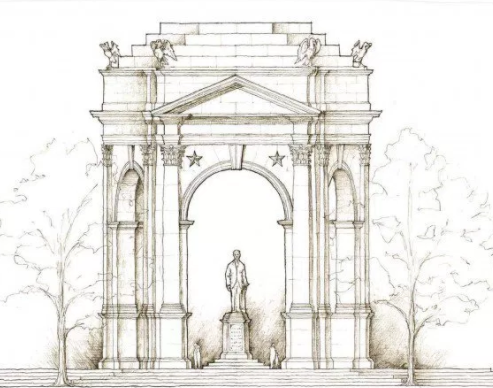 The memorial would be built immediately upon approval and occupy the Northeast quadrant of the lawn near the Washington Monument with a view of the White House. 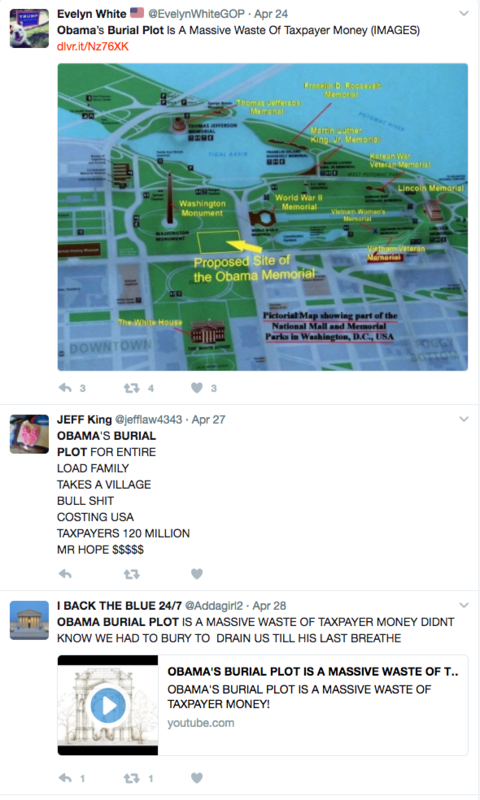 The story goes on to report that the Obama burial plot will feature a giant bronze statue and burial crypts for the former president and his entire family under a large arch. A rendering of a national monument to President Dwight D. Eisenhower has been misidentified as a burial plot for the Obama family. Bill Clinton Files for Divorce from Hillary Clinton-Fiction!